Amazingly enough, the first Volkswagen Beetle was made in 1938 but only reached mass production in 1945. Although it retains its iconic styling, the 2017 Beetle has modern amenities with the choice of vibrant or muted colors, bi-xenon headlights, and a panoramic sunroof to continue to stand out. 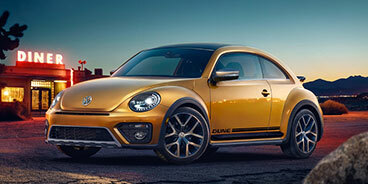 The rear spoiler and 18-inch alloy wheels, along with revised bumpers, only help show how far the Beetle has come over the years. 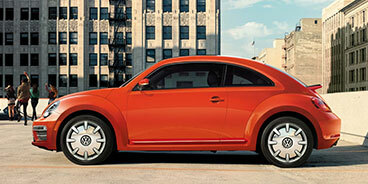 You can buy the Volkswagen Beetle at Street Volkswagen regardless of the trim you want. The Beetle is available with retro-modern gauges and the heritage-inspired glovebox to show off its history, while leather-wrapped multifunction steering wheel, leatherette seating, and customizable interior ambient lighting give it a high-end feel. The VW Car-Net® App-Connect system lets you seamlessly connect your smartphone. Advanced safety features, like Blind Spot Monitor, Park Pilot, and Rear Traffic Alert, provide protection. The base 1.8T trim for the 2017 Beetle has the styling and features you need in the most affordable configuration. The top-of-the-line version of the Beetle is the SEL trim in the convertible body style, delivering many additional features. See for yourself how the 2017 VW Beetle surpasses expectations. Contact Street Volkswagen to take this classic hatchback on a test drive around Amarillo, Texas.